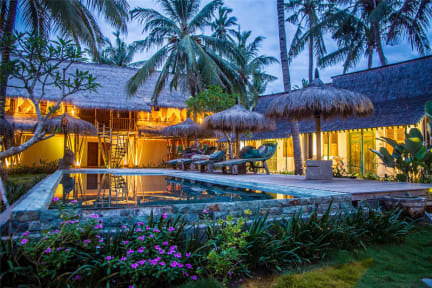 Captain Coconuts Gili Air is a resort style Hostel Situated in Gili Air, sustainably designed we are mindful of our environment and surroundings, we offer a sanctuary for weary travellers in a safe and peaceful setting. Captain Coconuts Gili Air offers guest the unique experience in the hanging bed bamboo lodge, each bed is suspended from the room and are equip with privacy/mosquito screens and private fan, the allocated lockers are fitted with power/charging stations for practical convenience. Hot water shower is available to all guest courtesy of Solar hot water system, with every toilet fitted to the Bio-Septic system, guest can rest and relax knowing their traveller foot print will not affect the fragile island environment. Second time staying at Captain Coconuts and loved it! Couldn’t recommend enough. Great food, chilled atmosphere and lovely staff. Amazing hostel. This place is beautiful and the pool is great! The free breakfast is great but the food is expensive off the menu. The bed is a swing so you might wake up with a bit of motion sickness like we did! But overall lovely place to chill out! Worth every penny. The dorm style room was super cute. The beds were comfortable and you have our own little fan over your bed to cool you down. The staff were very friendly and helpful. The breakfast was really nice. The place it’s self was clean. There wasn’t much of an atmosphere but that didn’t matter because it was a perfect place to chill and relax. I would recommend this place to everyone and will definitely return. Thank you for a fantastic stay. I fell in love with this place! Meant to stay 2 nights but stayed 5 nights. The hanging beds were a novelty and comfortable. Nice breeze coming through in the night, fan over each bed too. Great included breakfast, staff were super helpful when booking trips or boats. Ideal location! Beautiful dorms, hanging beds are so nice and the curtains add privacy. Given a towel and lock for the cupboard which was good. Amazing breakfast, and the rest of the food served in the cafe is lovely for a great price. Harbour is a 10-15 min walk, and the best beach with good restaurants is less than a 5 min walk away from the hostel. Staff were really friendly and attentive. Lovely pool and surrounds- would definitely stay again and can really not speak higher of the hostel and stay! Probably the best hostel I’ve stayed in! Really loved the airy and open dorm rooms and the pool and surroundings are lovely. Best free breakfast I’ve had in Indonesia. Showers aren’t very powerful but do the job. We had a great time at captain coconuts! A beautiful hostel, great food and really good value for money. Thoroughly enjoyed our stay and would highly recommend. 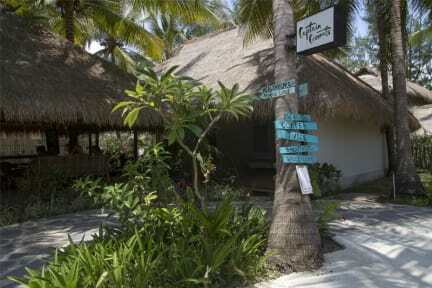 Lovely and unusual chill out place on Gili Air. We stayed in the airy bamboo lodge dorm in hanging beds... cool and comfortable! The staff make sure you’re well looked after. We really enjoyed film night in the garden with popcorn! The cafe food is delicious, the pool is saltwater but lovely to swim in, and lounging by the pool is lovely: the tall coconut trees provide shade from the fierce sun. The beach is just down the path, excellent sunset spot, and the island is easily accessible. Hostel is really pretty has a lovely pool and cute little private huts around the side. The food is great and free breakfast is delicious! However the dorm beds in my opinion are awful! I spent two nights here and had the two worst nights sleep in 5 months of travel. The beds are basically giant swings, I woke up multiple times in the night where I turned over and would send the swing into a perpetual swinging motion and felt like i had spent the night sleeping on a roller coaster. Never again!